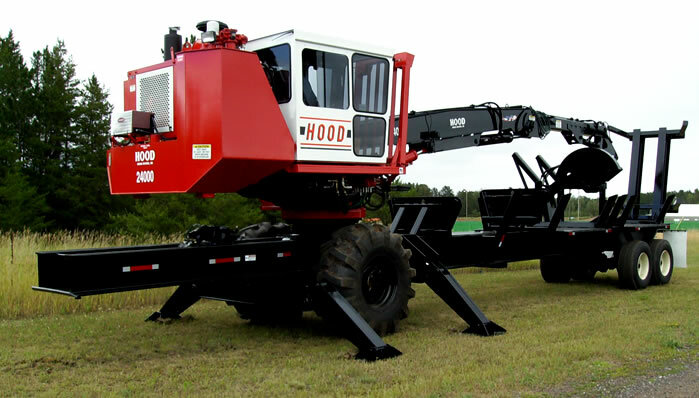 Mobile Slasher – Hood Equipment, Inc. The 43 inch diameter heavy duty turntable bearing is rated for loads in excess of 600,000 ft. lbs. The one inch diameter mounting bolts provide mounting capability to match bearing capacity. Heavy duty high tensile boom weldments incorporate secondary boom cylinder guarding integral to the boom. High tensile alloy hinge pins are free floating within manganese bronze bushings. Boom actuation cylinders are two 6" bore cylinder for main boom with one 7" bore cylinder for secondary boom. A 30 foot boom is standard, stationary heel racks and live heel booms available as options. Deluxe cab 38" wide x 60" long x 61" high with deluxe operator seat. Tinted safety glass forward sloping front window, roof window, sliding side window and rear window. Insulated with slam door. Instrument panel, wiper/washer, heater/defroster and interior lights and stereo. ENGINE ACCESSORIES/INSTRUMENTATION - Twelve volt alternator/ regulator, oil/fuel filters, engine gauges/hour meter, muffler and air cleaner with precleaner. Automatic engine shutdown system controlled by engine coolant temperature and oil pressure. 130 gallon diesel fuel tank. HYDRAULIC SYSTEM - 120 gallon oil reservoir with filtered breather, double element 300 GPM 9 micron absolute return line filters with sight gauge and condition indicators. High capacity constant volume oil cooler. Six inch bore outrigger cylinders with load holding valves (4). Six inch bore main boom (2) and secondary boom cylinder (1). Three Vickers hydraulic pumps providing 150 GPM with individual pumps for main boom, secondary boom and swing functions. 10 GPM pump for auxiliary and servo functions. High capacity pressure control valves have com­bined operating ratings of up to 200 GPM at pressures up to 2500 PSI. Hydraulic over hydraulic joystick servo system for infinite control response with maximum operator comfort. Pilot system flow and pressure controlled to fine tune control response with valve activation. Deluxe ultra-adjustable seat incorporates control mounting in armrests for additional operator comfort. ROTATION SYSTEM - Continuous rotation capability is provided by two heavy duty planetary/hydraulic motor swing drive units with built in fail safe disc brakes. The swing drives provide 37,500 ft lbs of rotational force in conjunction with the additional safety of automatically actuated fail safe swing brakes. UPPER STRUCTURE - The upper structure incorporates a 130 gallon fuel tank fabricated of heavy plate which also serves as a counterweight. Struc­ture is designed to provide good access to components and routine service areas. Cab guard is integral with upper structure, independent of cab, preventing cab damage which can occur on minor impact when guarding is supported by the cab. High tensile alloy main boom pin and main lift cylinder pin are free floating within manganese bronze bushings. ARTICULATED STEERING SUBFRAME - Heavy duty 21" deep H beam design high tensile steel weldment rough terrain type carrier with integral stabilizer housings. Four high ­tensile steel stabilizers with 24” square pivoting pads that extend to a working width of 17 feet at grade with additional below grade travel of approximately 18 inches. The 6” bore stabilizer cylinders provide unmatched machine leveling capability under virtually any conditions. Optional truck fifth wheel pin and accessary hookups for highway transportation. AXELS – Rear self propelled drive axle rated 35,000 lbs capacity with 23.1 X 26 special forestry style tires for high flotation and positive traction. Front twin tandem axles rated 44,000 lbs capacity with 425/65R x 22.5 tires on a Hutchens single point suspension. Rear drive axle air over hydraulic disc brakes with front twin tandem axle air brakes. Travel a two speed manual transmission driven by a fixed displacement hydraulic motor. 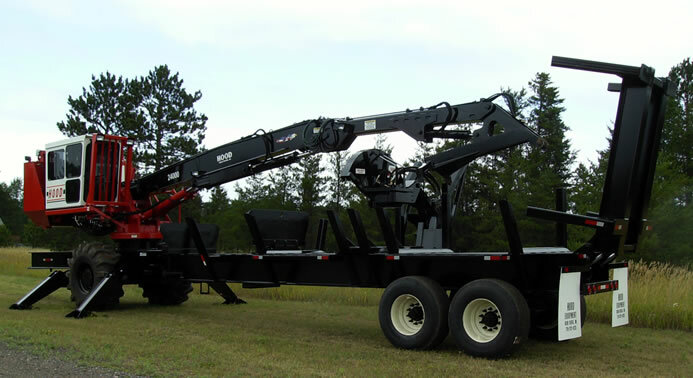 SLASHER – 100” to 16’ – 8” cutting deck length with optional 4’ to 24” cuts. 5’ saw travel over slasher bed. Hydraulic foldup 5’ back deck extension with optional stabilizers. ELEVATING CAB - OPTIONAL - Hydraulically actuated cab platform allows operator to adjust cab height at any time while seated within the cab. The 42" of infinitely adjustable cab height allows cab heights of up to 17 ft. above ground level. This feature enhances operator visibility when conditions warrant yet furnishes a normal cab height for routine operation. OPTIONS • Hydraulic operated dump table • Additional stabilizer leg on carrier saw end • Variable displacement travel motor utilizing full range low torque/high speed to high torque/low speed. • Tires 23.5 x 25 lug or 28L x 26 • 32 foot boom or special longer boom lengths available from engineering requests.